Three primary school students from the city are on their way to the US to compete in an international robotics competition next year. 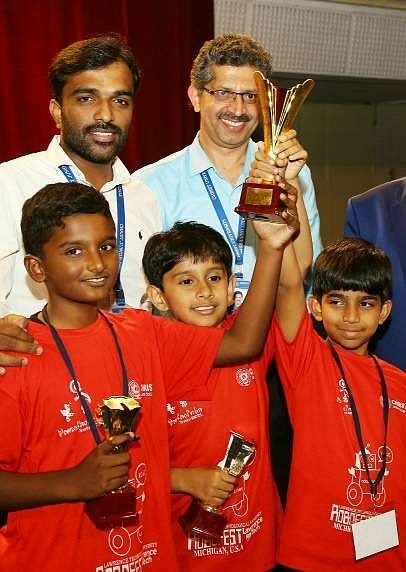 BENGALURU: Three primary school students from the city are on their way to the US to compete in an international robotics competition next year.Dheemanth Suddekunte and Gautam Saravanan are grade three students of Trio World Academy while Siddharth V Dharwar is from Poorna Learning Center. The three qualified for the international competition after winning the national Robofest competition that saw participation from around 60 schools. The three students won in the junior sumo wrestling category and will now compete in the international leg of the competition that will be held on May 2018 in Michigan. Two teams competed at a time with each other where their respective robots wrestled on a white table with the objective of knocking off the opponent robot from the table. Each one has been precisely programmed to avoid the edges to survive on the table without falling off. Dheemanth further says that the robots were “all built nicely” but the main challenge was to push the other robot away. “I have been interested in robotics since last year. It started with my mother. I am very excited to go to the US and compete there,” he adds. Divyashree Nagarajan, Dheemanth’s mother runs a robotics teaching center called RoboNimble. She mentored the three students. She is an electronics engineer who worked in IT and started the centre last year soon after returning from the US.